Hollywood Bowl is a very lively place and there's a lot to do! There are 26 lanes for tenpin bowling. A group of 8 people can bowl in one lane. There is a bar and cafe and you can also play video games. 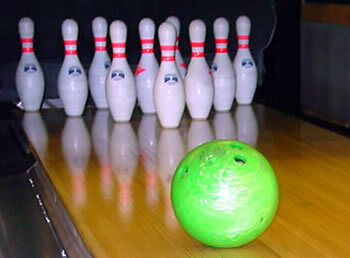 Some lanes have bumpers on either side of the lane - so you can't help but score! On Bank Holidays it is open from 10.00am until late. It's a good idea to call first. Groups with less than 8 people should book the day before going bowling. Groups with more than 8 people should book 8 weeks before going. This is the booking number to call 0207 237 3773. If you are going to Hollywood Bowl for the first time it is a good idea to call 0207 237 3773 to arrange a concession price. The price of the ticket depends on what time you go. From 6.00 pm to closing time on Monday, Tuesday, Wednesday, Thursday and Friday. All day on Saturday and Sunday. The off-peak times are from 10.00 am to 6.00 pm on Monday, Tuesday, Wednesday, Thursday and Friday. It costs £3.00 to go at off-peak time. It costs £2.25 to go at off-peak time. It costs £9.60 to go at off-peak time. It costs £14.00 to go at off-peak time. Hollywood Bowl is next to Surrey Quays Shopping Centre and next to the UCI Cinema. There are 5 accessible parking spaces and lots more in the car park in front of Hollywood Bowl. 1, 47, 188, 381 are the nearest mobility buses. N1, N47 and N381 are the night buses. Bus P13 also stops here but is not accessible. Buses stop at Canada Water or Surrey Quays, which is across the roundabout from Hollywood Bowl. (Jubilee line) Canada Water underground station is about 490 metres from Hollywood Bowl. Canada Water underground station is accessible for wheelchair users. (East London line) Surrey Quays underground station is about 500 metres from Hollywood Bowl. Surrey Quays underground station is not accessible for wheelchair users. South Bermondsey mainline station is about 1500 metres from Hollywood Bowl. The mainline station is not accessible for wheelchair users. South Bermondsey trains leave from London Bridge station. The main entrance is flat and very wide. There is usually a person door at the door to greet you. Hollywood Bowl is a very accessible building. There is a small ramp to get onto the bowling lane. There is plenty of room for a wheelchair user to move around inside Hollywood Bowl. There is a unisex accessible toilet. The minimum door width is 810 mm.